I rode from PDX to San Fran last year, had a blast so this year I am planning Vancouver to Portland. The book" Bicycling the Pacific Coast " has two options an inland route and peninsula route. The peninsula route goes goes from Victoria to Port Angeles and then down to Twin Harbors vs the inland route that goes from via San Juan islands then Anacortes then down to Twin harbors, after twin harbors the routes are the same. I am favouring the peninsula route but would love to hear peoples thoughts on one vs the other. Going East from Port Angeles and south toward Tacoma (I haven’t cycled) should offer a bit less traffic - as auto traffic has many options. But then more small towns so more locals on the roads. Several possibilities south from Anacortes. Haven’t read the book quoted. Last edited by Wildwood; 03-22-19 at 05:42 PM. Maybe the detour out to Neah Bay & Cape Flattery will be of interest ..? I can't remember if "Bicycling the Pacific Coast" shows going north from Vancouver up the Sunshine Coast to Powell River then over to Comax on Vancouver Island before heading south, but that is a nice way to go. My wife and I rode that route when we started our PCH ride. Following the book we took the interior route along the Hood Canal. The western most route through Washington does follow the coastline near the ocean very much. If you go to Astoria, Highway 30 is not a bad ride to Portland, I rode it several years ago from Astoria to Portland as part of a loop that included Oregon's portion of the Pacific Coast Highway. Unfortunately, the loop was clockwise that resulted in riding the coast south to north. It was still a great ride, but the headwinds made me work a little harder. Both the Willipa Hills trail and the Olympic Discovery trail are getting better with age. If you don't want to mess with riding out to the coast along the Columbia River take the train to Centralia and start there. Follow the Willipa Trail until conditions warrant hopping on the road. (Parts of the "unimproved" section can be unrideable if they haven't mowed.) Aberdeen to Forks is not very interesting riding but then you can take the Olympic Discovery trail. I have toured from Vancouver to Oregon twice. First I rode via the ferries to Victoria then Anacourtes and then around the Olympic Peninsula and south to Astoria. I was hoping to ride down the coast, so I did not head inland to Portland. I was disappointed by the road around the Olympic Peninsula until Gray's Harbor because it was not on the coast and too many lumber trucks, but others have found it good. Last summer I rode from Vancouver BC to Vancouver WA following the inland route staying at state parks in WA and I thought it was much better. 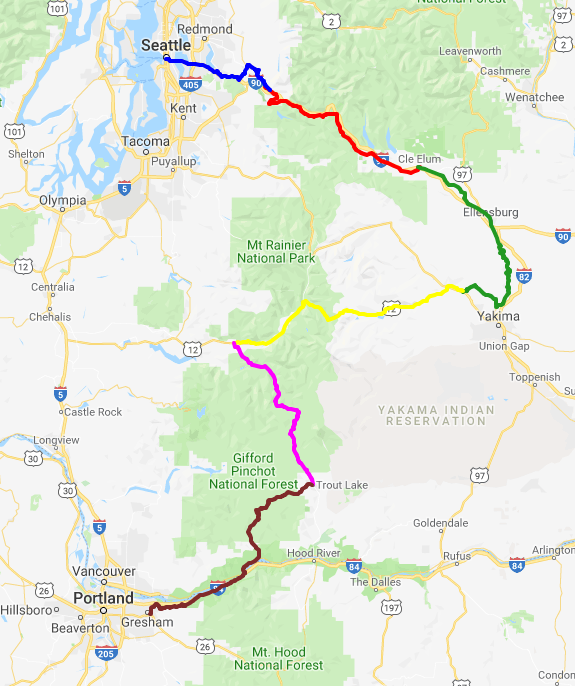 I used the inland route from the ACA maps until Longview, WA then followed the I-5 for a bit until I could get side roads from Woodland to the state park at Battle Ground, WA. It is an easy ride to Portland from Battle Ground. If you are not wanting to stay at the campground in Battle Ground (the main reason I went there), you could follow the (STP) Seattle to Portland 2 day tour route that takes you into Oregon just after Longview and then south on Hwy 30 until you are near Portland. For me, riding from Vancouver BC to Portland is four hard days or five full days and who knows how long if one is taking it easy, because it is some pretty country. I haven't been north of Seattle, but I have done Seattle to Portland. Rather than going along the coast, consider heading inland to take in all of the great mountain ranges the state has to offer. Day 5 is a lot of gravel, if you prefer to stay on the pavement there's an alternate, and quite nice alternative. Day 2 on this is almost exclusively on the John Wayne Trail, a rails to trail conversion that goes through a 2 mile long tunnel!